Low back pain (LBP) often keeps athletes out of training and competition. Poorly targeted rehabilitation can delay recovery and their return to sport. Classification-based cognitive functional therapy (CB-CFT) is a contemporary approach to the targeted management of athletes with LBP. Research has supported its efficacy for non-specific spinal pain in both athletic and non-athletic populations1,2 as well as for specific spinal conditions (e.g. spondylolysis and spondylolisthesis), where conservative management is indicated3. Using this approach, identification of the athlete’s injury mechanism is achieved through a combination of knowledge of the sport, understanding of the symptom behaviour and assessment of the athlete’s function in the specific pain provocative tasks and postures. (See elsewhere for more detail of this assessment approach4,5). Figure 1 shows a number of intrinsic and extrinsic factors that are known to contribute to the development and persistence of LBP in athletes. One of these factors – motor control – often becomes the target of rehabilitation efforts. In this context, motor control retraining refers to neuromuscular control of the body (trunk and limbs) in static postures and functional tasks, based on the assumption that impairments in motor control contribute to the individual’s LBP. Using the CB-CFT framework, motor control deficits specific to the individual athlete should be targeted. These factors should be specific to the demands of the athlete’s sport and the approach should be embedded in a cognitive learning process. While motor control retraining and targeted conditioning are integral components of the CB-CFT approach, consideration must also be given to all the factors that contribute to the development and persistence of LBP in athletes (Figure 1). 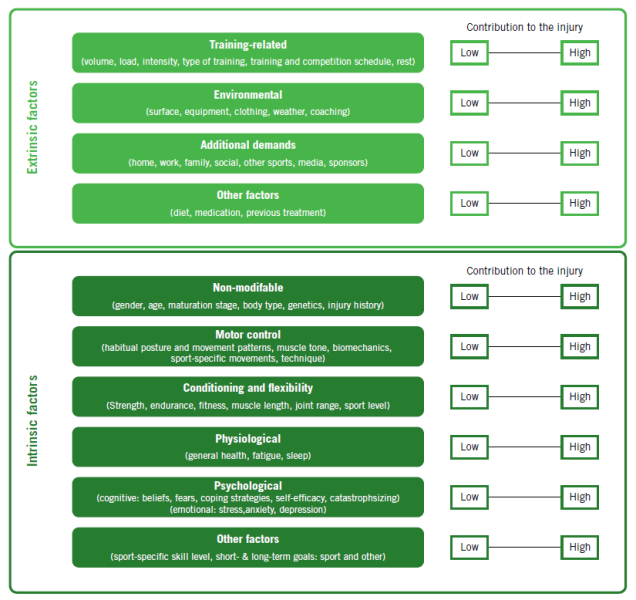 Effective evaluation of injury/pain risk requires consideration of sport-specific factors (i.e. individual demands of the sport and training volume) as well as individual factors (both modifiable and non-modifiable). These will not be covered in this article, but these factors form an integral component of a comprehensive management plan for each athlete with LBP. · cognitive and psychological factors. As outlined in Figure 1, sporting and non-sporting tasks may contribute to an athlete’s motor control presentation. As an example, spinal posture may be a factor in both habitual and sporting contexts. Habitual postures provide a platform on which complex movements are built and are predictive of dynamic spinal postures during sporting tasks6. For example, hyperlordotic spinal postures are associated with higher levels of trunk muscle co-contraction7, reduced capacity for spinal rotation and side bending and are known to carry a greater risk for spinal pain8,9. In this instance, hyperlordotic spinal posture for a tennis player may have relevance in the sporting context during their serving motion as well as habitual, non-sporting tasks such as their part-time employment as a barista, where they are standing in hyperlordosis for extended periods of time. It is also important to understand how trunk motor control adapts to load and task demands. Greater levels of trunk muscle co-contraction and intra-abdominal pressure occur during high load and asymmetrical functional loading tasks such as jumping and landing. This is associated with high levels of spinal stiffness and compressive loading forces on the spine10. The motor system must balance the need for spinal control and stability while minimising excessive compression forces – a known risk factor for spinal injury11. In sports where there is additional respiratory demand, the motor control system needs to adapt to the competing demands of controlling intra-abdominal pressure and trunk control, while maintaining respiration. Vulnerability to spinal strain may occur where the motor system either fails to control movement effectively (motor control deficit), overestimates the demand – resulting in excessive spinal loading (excessive stability) or is unable to co-ordinate the competing respiratory and stability demands of the sport (variable stability). Below are two case studies that reflect common presentations of athletes with LBP associated with impairments in motor control. Gradual onset of central LBP over 4 months. Symptoms have worsened over the past 3 weeks, to a point where he has been unable to complete a hard rowing session due to severe back pain. Due to compete in a major event in 2 months. · Injury mechanism: non-traumatic (overuse). · Diagnosis: non-specific. Mild disc degeneration with central disc bulge at L5/S1 on MRI, with no radicular pain. No other findings to indicate red flags or specific pathology. · Pain characteristics: mechanical. Pain is aggravated by both habitual (prolonged sitting and driving) and sport-specific factors (rowing ergometer and on-water). Eased with walking and laying down. · Training: doubled the training load 5 months ago. Has been doing heavier squats and leg press in the gym. · Environmental: has increased number of sessions using a rowing ergometer prior to competition in the last month. · Additional demands: pressure from coach to continue/complete all training sessions regardless of pain. Has also been sitting more when studying for upcoming university exams. · Non-modifiable: previous history of similar LBP 2 years ago while studying for exams and during rowing competition. Resolved after 1 week. 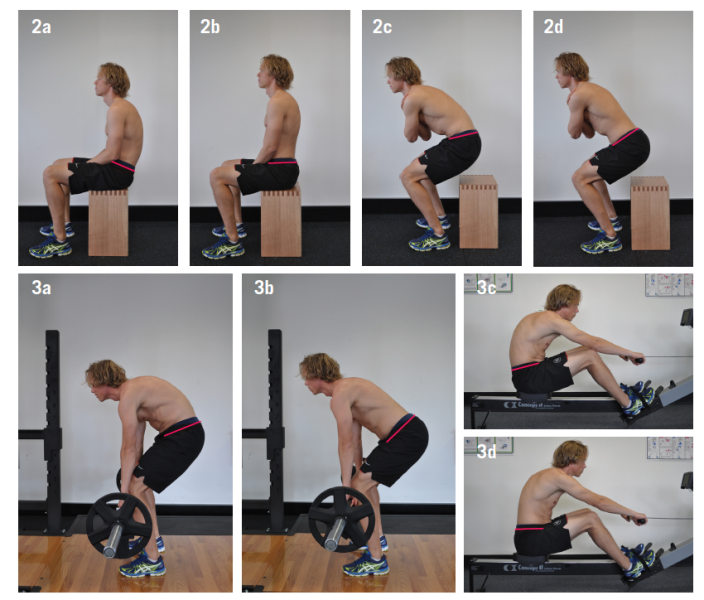 · Biomechanics: flexed lumbar spine in sitting, squatting and during the drive phase on rowing ergometer. · Conditioning: poor hamstring flexibility limits anterior pelvic tilt in the catch position and contributes to flexed lum-bar posture with squat technique in the gym12. Poor body awareness and dif-ficulty dissociating lumbo-pelvic control from thorax. Poor endurance of lower limbs and lower lumbar extensors with squatting and Beiring-Sorenson test. · Psychological: mild distress over inability to train for upcoming event. Worried about the disc bulge on MRI. · Response to injury: maladaptive. End range flexion of lumbar spine with habitual postures (e.g. sitting), squatting in gym and during drive phase of rowing. This is pain provocative. Correcting these postures (anterior pelvic tilt with relaxed thorax) resulted in less back pain, but increased perception of fatigue in the back and legs. · Movement classification: flexion control impairment. This rower developed mechanical LBP related to repeated exposure to loading lumbar spine flexion. This is due to a combination of habitual and sport-specific flexed postures (sitting in chairs, rowing and gym exercise postures) as well as the increased exposure to lumbar flexion from studying and the increased load on the spine with more rowing sessions and more time on the ergometer. The diagnostic summary listed above was outlined in a diagram to the athlete in order to demonstrate all factors involved with the development and persistence of his LBP. The athlete was educated regarding the poor correlation between disc bulges and pain/pain-related disability. Emphasis was placed on the need to unload these sensitised spinal structures from end-range flexion. A clear plan of rehabilitation and modified training was developed and agreed upon with the athlete. This was done in consultation with the coach. 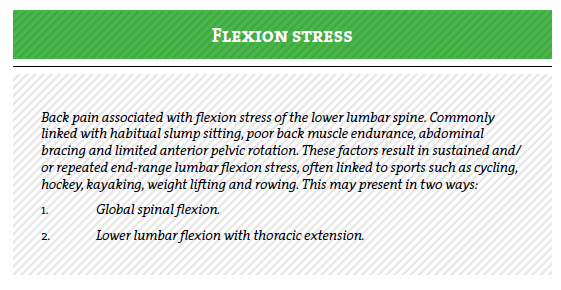 This component aimed to provide alternative strategies to reduce end-range lumbar flexion strain during the athlete’s postural and movement patterns allowing for pain-free sitting and moving. Using the aggravating factors on the Patient-Specific Functional Scale, the physical therapist trained the athlete to sit with less lumbar flexion via anterior tilt of the pelvis while retaining a relaxed thoracic spine (Figure 2). This was complemented with hamstring and hip extensor muscle stretching for increasing hip flexion in the rowing position. The athlete was also trained to perform the previously pain-provocative tasks with increased anterior pelvic tilt and a relaxed thoracic spine, thereby reducing his pain. For example, during weightlifting, squatting and in the rowing drive position, the athlete had reduced pain when he anteriorly tilted his pelvis, maintained a more relaxed thorax and bent more through the hips and knees rather than the lumbar spine (Figure 3). 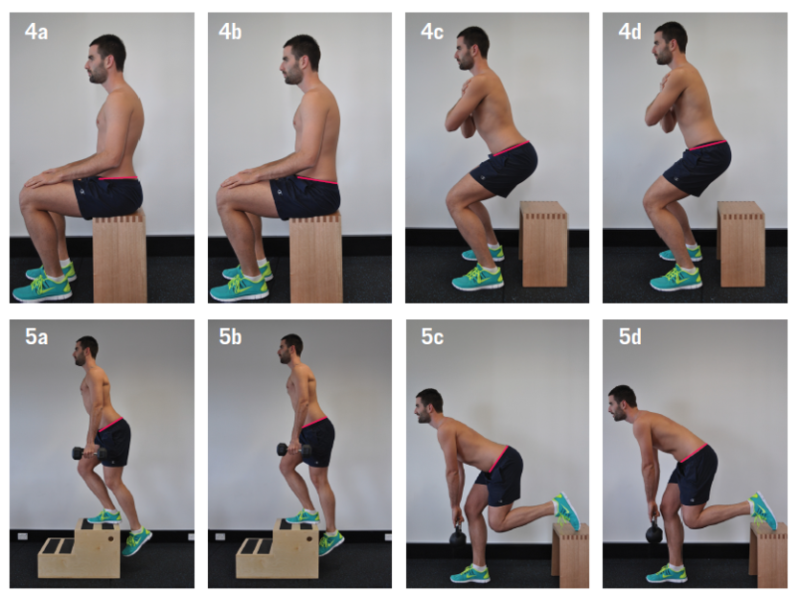 These exercises aimed to initiate the drive to perform the task via the legs, as opposed to the trunk. This was reinforced via feedback through use of video and mirrors. Cross trainer, water running, cycling with reduced lumbar flexion. Ceased leg press. Squatting and lifting technique with reduced lumbar spine flexion and lighter weight was taught. Addition of squat holds to build endurance of new posture, with the use of weights in front of his body. Technique was reinforced via feedback through use of video and mirrors. Athlete was able to maintain 50% of rowing sessions at 70% intensity for the first week with a gradual progression to full training over a 4-week period. Criteria for progression of training volume and intensity was based on relative pain-free performan-ce of all rehabilitation exercises and minimal symptom aggravation following the previous week’s rowing sessions. History of episodic low back pain and left hamstring ‘tightness’ over 4 years. Injured back 6-months ago after landing in hyperextension following a tackle from behind. Initial symptoms included back pain, left posterior thigh and calf pain and mild pins & needles in his left heel. Persistent symptoms are now back pain and left posterior thigh ache. · Injury mechanism: traumatic with hyperextension mechanism. · Diagnosis: specific. Grade 1 spondylolisthesis L5/S1 on MRI, normal flexion/extension X-rays. Normal neurological examination and no other findings to indicate red flags or any other pathology. · Pain characteristics: mechanical. Aggravated by standing, sleeping prone, running, kicking and sitting upright. Pain is eased with spinal flexion and slumped sitting. · Training: has not been training since injury. Had been doing heavy dead lifts and roman curls for his back and hamstrings in the gym prior to his injury. · Environmental: had reported previously experienced increased hamstring tightness following matches played on hard ground. · Additional demands: pressure to stay in first team for his club, as he may not get a contract next year if out injured for too long. 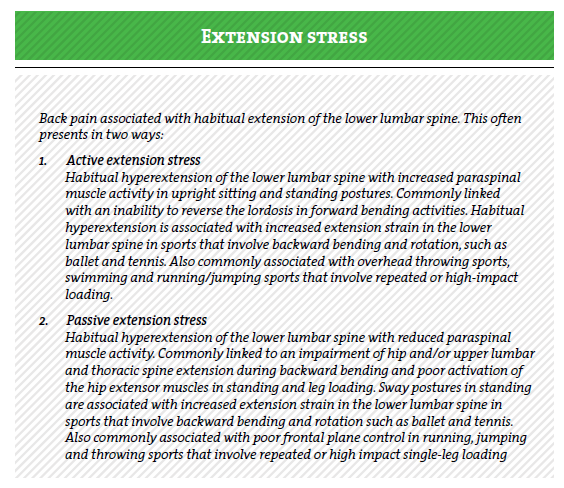 · Other: previous back manipulation and hamstring and core strength work has not helped recurrent symptoms at all. · Non-modifiable: ongoing history of recurrent back pain and hamstring tightness. Spondylolisthesis. · Biomechanics: hyperlordotic lumbar spine posture. Lack of reversal of lordosis and relaxation of back and abdominal wall muscles in sitting, standing and forward bending activities. · Conditioning: reduced hip flexor and quadriceps flexibility. Weak hip extensor and abductor muscles. · Physiological: recent lack of sleep, partly due to pain, but also with worry about back problem not resolving. Sensitised L5/S1 to palpation and extension loading. · Psychological: significant distress over future playing career. Very worried about spondylolisthesis – told he may need surgery on his back. Now hyper-vigilant about holding his core muscles on at all times to ‘stabilise’ his spine. Fear-avoidant of doing any activity that gives him any sort of back pain. · Response to injury: maladaptive. Both in his over-protective movement patterns, as well as his beliefs regarding his spine being unstable and the need to always tense his core muscles. During examination it was revealed that training the relaxation of his abdominal wall and back muscles via diaphragm breathing and training posterior pelvic tilt via the hips reduced his pain during provocative tasks and movements. · Movement classification: active extension control impairment. This soccer player had a history of underlying low-grade LBP and muscle tightness associated with his hyperlordotic postures and movement patterns that involve a dominance of lumbar extension. Previous rehabilitation exercises and beliefs have reinforced this pattern. He had an acute hyperextension injury to his back that is slow to recover, partly due to his maladaptive beliefs and movement behaviours. The symptomatic level is at the same level as his spondylolisthesis, but there is no indication of spinal instability or any other signs to suggest he will not respond well to appropriate conservative rehabilitation. The repeated mechanical extension stress due to his habitual extended postures and movement patterns, reinforced by his lack of hip flexor flexibility and beliefs about protecting his spine, are contributing to his on-going symptoms. The diagnostic summary listed above was outlined in a diagram to the athlete in order to demonstrate all factors involved with the development and persistence of his symptoms. The athlete was educated regarding the poor correlation between grade 1 spondylolisthesis and chronic LBP-related disability. It was explained to the athlete how he had adopted protective movement patterns associated with co-contraction of the core trunk muscles, leading to increased loading and pain provocation. The importance of relaxing the spine out of hyperlordosis and reducing the compressive load of the trunk muscles during simple tasks such as standing and sitting to reduce focal stress was explained. The athlete was able to directly experience pain relief when he relaxed his trunk muscles and reduced his lordosis during the provoking activities. This was reinforced via feedback through use of video and mirrors. Emphasis was placed on the need to unload sensitised spinal tissues during repeated and sustained end-range extension loading. A clear plan of rehabilitation and modified training was developed and agreed upon with the athlete. This was done in consultation with the coaching and sports science staff. This component aimed to provide alternative strategies to normalise the athlete’s postural and movement patterns allowing for pain-free sitting, standing and moving. Using the aggravating factors on the Patient-Specific Functional Scale, the physical therapist trained the athlete to sit with less lumbar extension via posterior tilt of the pelvis and relaxation of the abdominal muscles (Figure 4). This was complemented with hip flexor and quadriceps muscle stretching (in lumbar flexion) for consideration of increasing hip extension in upright postures and activities. The athlete was also trained to perform the previously pain-provocative tasks with increased posterior pelvic tilt, thereby reducing his pain. For example, during sit to stand, squatting and in a lunge position, the athlete had reduced pain when he posteriorly tilted his pelvis and maintained a more relaxed abdominal wall. Single-leg loading exercises were used as a functional retraining position to reduce lumbar lordosis and increase activation of the hip abductors and extensors when the athlete was positioned correctly (Figure 5). Cycling, rowing ergometer with emphasis on increased lumbar flexion. Ceased roman curls, improved squat and lifting technique (reduced lordosis and abdominal bracing) and added single leg dead lift and high (40cm) step-ups. The athlete was able to return to jogging and light skills at 50% intensity after 2 weeks, building up training intensity by 25% in the next 2 weeks. He returned to full training at 4 weeks then played part of a match symptom-free at 5 weeks. CB-CFT provides specific, targeted intervention directed at the intrinsic and extrinsic factors that have been assessed to be contributing to their condition. We have provided two specific cases above that outline how to go about dealing with two common types of motor control patterns. The general considerations for CB-CFT are as follows. · Emphasis on therapeutic alliance. · Education regarding the multidimensional factors contributing to the pain experience. · Epidemiological advice regarding spinal pathology and radiological imaging. · Addressing lifestyle, cognitive and emotional issues, if present. · Training motor control though enhanced body awareness, posture, movement control with the use of mirrors, videos and intrinsic feedback. · Teaching the athlete to adopt adaptive coping behaviours by providing strategies for optimal spinal loading and pain control. · Develop adaptive pacing strategies for graduating training loads. It is essential for athletes to have a clear understanding of their injury to promote active participation in rehabilitation. All stakeholders involved with the athlete should be included at an early stage. Conflicting information is related with poorer outcome from injury, while clear communication and consistent messages are associated with more favourable outcomes. The aim of functional intervention is to provide the athlete with specific and targeted strategies to normalise their postural and movement patterns as quickly as possible in order to achieve pain control. This involves three stages: specific movement training, functional integration and targeted conditioning. Specific focus and rate of progression through the stages will be dependent on the individual’s presentation. A good rule of thumb is if the exercises are pain-free or without exacerbation of pain, and can be performed with appropriate motor control and biomechanics, then they are probably safe. This process involves liaison with strength and conditioning, rehabilitation and coaching staff to ensure the appropriate rate of exercise progression is consistent. While general base strengthening exercises are important, when considering athlete rehabilitation or injury prevention, the aim should be to produce a programme than develops base, functional and sport-specific elements tailored to the athlete’s individual skill level, conditioning level, sport and functional deficits. In order to improve performance, the emphasis needs to be on training for the specific tasks involved in combination with general strengthening exercises13,14. High-load exercises such as squats and deadlifts are commonly used for high-level athletes requiring optimal strength and power for performance. It is our experience that these exercises, if performed incorrectly, can be inappropriate for athletes recovering from spinal pain. Importantly, recent unpublished data supports that the optimal posture in terms of maximal leg power and minimal spinal load involves a relatively flexed (not lordotic) spine15. Retraining of such exercises in athletes with spinal pain requires consideration of their individual pain-provocative spinal postures as outlined in the cases above. In conclusion, LBP in athletes is a complex, multi-factorial problem that requires skilled, targeted intervention based on each individual’s presentation. In the sporting environment where the focus of spinal pain management is often on patho-anatomical diagnosis, core stability training and correction of biomechanical faults, a shift towards individualised targeted management is required. 1. Vibe Fersum K, O'Sullivan P, Skouen JS, Smith A, Kvåle A. Efficacy of classification-based cognitive functional therapy in patients with non-specific chronic low back pain: a randomized controlled trial. Eur J Pain 2013; 17:916-928. 2. Cañeiro JP, Ng L, Burnett A, Campbell A, O'Sullivan PB. Cognitive functional therapy for the management of low back pain in an adolescent male rower: a case report. 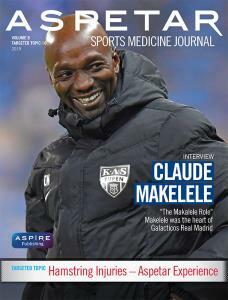 J Orthop Sports Phys Ther 2013; 43:542-554. 3. O'Sullivan P, Twomey L, Alison G. Evaluation of specific stabilising exercise in the treatment of chronic low back pain with radiological diagnosis of spondylolysis and spondylolisthesis. Spine 1997; 22:2959-2967. 4. O'Sullivan P. Diagnosis and classification of chronic low back pain disorders: Maladaptive movement and motor control impairments as underlying mechanism. Man Ther 2005; 10:242-255. 5. O'Sullivan P. It's time for change with the management of non-specific chronic low back pain. Br J Sports Med 2012; 46:224-227. 6. Wade M, Campbell A, Smith A, Norcott J, O'Sullivan P. Investigation of spinal posture signatures and ground reaction forces during landing in elite female gymnasts. J Appl Biomech 2012; 28:677-686. 7. O'Sullivan PB, Grahamslaw KM, Kendell M, Lapenskie SC, Moller NE, Richards KV. The effect of different standing and sitting postures on trunk muscle activity in a pain-free population. Spine 2002; 27:1238-1244. 8. Burnett A, O'Sullivan P, Ankarberg L, Gooding M, Nelis R, Offermann F et al. Lower lumbar spine axial rotation is reduced in end-range sagittal postures when compared to a neutral spine posture. Man Ther 2008; 13:300-306. 9. Smith A, O'Sullivan P, Straker L. Classification of sagittal thoraco-lumbo-pelvic alignment of the adolescent spine in standing and its relationship to low back pain. Spine 2008; 33:2101-2107. 10. McGill SM, McDermott A, Fenwick CM. Comparison of different strongman events: trunk muscle activation and lumbar spine motion, load, and stiffness. J Strength Cond Res 2009; 23:1148-1161. 11. Parkinson RJ, Callaghan JP. The role of dynamic flexion in spine injury is altered by increasing dynamic load magnitude. Clin Biomech 2009; 24:148-154. 12. Gajdosik RL, Albert CR, Mitman JJ. Influence of hamstring length on the standing position and flexion range of motion of the pelvic angle, lumbar angle, and thoracic angle. J Orthop Sports Phys Ther 1994; 20:213-219. 13. Alfieri FM, Riberto M, Gatz LS, Ribeiro CP, Lopes JA, Battistella LR. Functional mobility and balance in community-dwelling elderly submitted to multisensory versus strength exercises. Clin Interv Aging 2010; 5:181-185. 14. Beard DJ, Dodd CA, Trundle HR, Simpson AH. Proprioception enhancement for anterior cruciate ligament deficiency. A prospective randomised trial of two physiotherapy regimes. J Bone Joint Surg Br 1994; 76:654-659. 15. Holder L. The Effect of Lumbar Posture and Pelvis Fixation on Back Extensor Torque and Paravertebral Muscle Activation [Ph.D. Theisis]. Auckland University of Technology; 2013.